Washing windows on a space colony hovering 35,000 meters above the earth is a dangerous job. Mitsu, a young window washer, knows this all too well. His father fell off the Ring System in an accident. Now, Mitsu's coworker Kageyama collapses on the job. Trying to save Kageyama, Mitsu inadvertently endangers his life. In recovery, Kageyama learns that exposure to UV rays has taken a toll on his immune system. He's forced to choose between his job and his health. Hisae Iwaoka is the creator of several one-shot manga, including Hana Boro (Flower Cookies) and Shiroi Kumo (White Clouds), both of which were serialized in IKKI magazine. A noted artist and illustrator, her installations have been displayed internationally in the group show "Tokyo Girls Bravo," curated by Takashi Murakami. 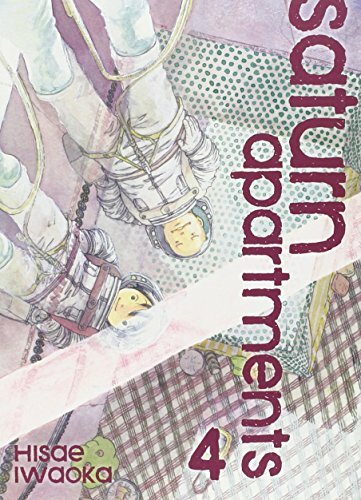 Saturn Apartments is her most recent series.